More than 20 meters could be the length of the relics of a wooden 7,000-year-old house, discovered by an international team of researchers near the city of Balti, about 100 km from Chisinau in Moldova. This is the first known so-called “long house” discovered in Moldova. 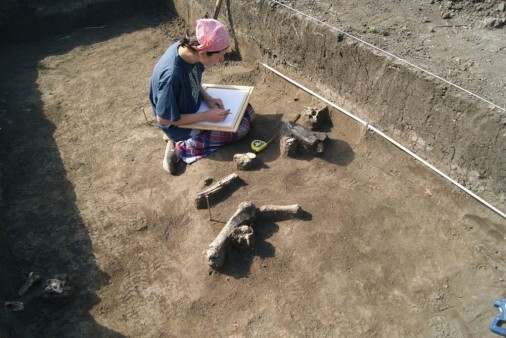 “This is an important discovery, because we finally have proof that representatives of the Linear Pottery culture, who inhabited huge areas in Europe, from Paris Basin in the west to Kiev in the east, built houses typical for this culture on the south-eastern frontiers,” said Dr. Maciej Dębiec from the Institute of Archaeology, University of Rzeszów and the University of Regensburg, who led the excavations in the town of Nicolaevca together with Stanislav Terna of the High Anthropological School University in Chisinau. 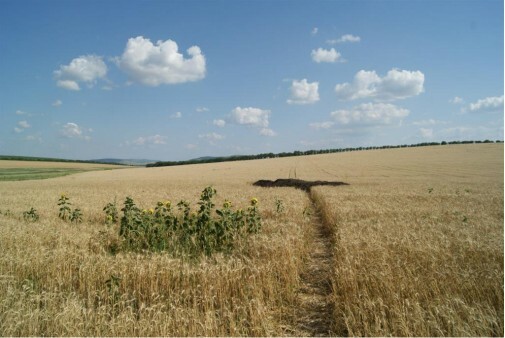 Only few similar relics of houses have been discovered in the neighbouring Ukraine, and none in Romania — which is why the discovery is very important for scientists. From approx. 7 000 BC, knowledge of breeding and cultivation began to spread from the Middle East to the territory of Europe; it was a huge cultural and social change. As a result, people abandoned their mobile lifestyle and settled down. In the new situation, it was very important to have a stable and safe place to live. In large parts of Europe, from approx. 5 500 BC, such places were very uniform, more than 20 m in length houses associated with the community referred to by archaeologists as the Linear Pottery culture. According to Dr. Dębiec, these houses were built based on the pile construction, wooden piles driven into the ground. Spaces limited in this way were filled with braid and covered with clay. Houses were covered with gable roofs. Scientists believe that part of the structure was separated specifically for farm animals. “Commonly, on both sides of the houses we discover cavities from which clay was taken to cover the walls. Then the pits were used for various purposes — as garbage, furnaces or cavities in which the dead were buried,” said Dr. Dębiec. Along one side of the house studied in Nicolaevca, in one such pit, archaeologists discovered the remains of an animal, probably a cow. Archaeologists believe they were not just garbage, but deliberate deposit, possibly associated with the sphere of beliefs. Scientists do not yet know the exact dimensions of the Moldavian “long house”. They assume that it can measure more than 20 in length and approx. 6-7 m in width. This year, in the second half of March, archaeologists plan to determine the specific layout in order to answer the question of the functions of its individual parts. The international team has selected two further places in Moldova where similar thousands of years old structures can hide underground. Their assumptions are based on previous geophysical surveys, which allowed to peek under the surface of the earth without driving the shovel. The house in Nicolaevca was discovered with this method.